Should Bob Geldof be blaming himself for Peaches Geldof's death? Home Scandal and Gossip Should Bob Geldof be blaming himself for Peaches Geldof’s death? Should Bob Geldof be blaming himself for Peaches Geldof’s death? 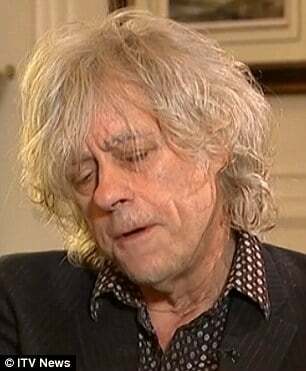 In an interview with the UK‘s ITV last night, Boomtown Rats singer Sir Bob Geldof left a sobering message with viewers when he told in an interview that he blames himself for the unexpected death of his daughter Peaches Geldof this recent April. Asked if he knew about Peaches’ drug addiction, he said: ‘Yes, of course I knew about it and we did more than talk about it, yeah. But I don’t want to go into that too much. ‘She was an adult. When they are 18 they are off and running. But you advise, you are there – the usual dad stuff. When they mess up you try to clean up the mess. You admonish. I’m certainly not benign about the whole thing’. Sir Bob would also tell that newspaper attacks on his daughters following their mother Paula Yates’s death from a drug overdose in 2000 had also ‘damaged’ them. ‘She was super bright. Too bright’, he said. ‘She could never be still so you look for something that sedates you I suppose. ‘A very errant mind that could focus intensely on a book which she would consume and just absorb it. Geldof said performing with the Boomtown Rats helps him to escape the grief of losing his daughter. The despondent father would finally add the following: ‘My life turned out to be extremely episodic. Ultimately one can’t help but wonder to what degree Sir Bob knew of his daughter’s drug use and how far he went to stem her use, yet then again how much say does anybody have, parent or not over another adult’s decisions in life? You cannot always save the people you love, they have to want to save themselves and it is a fight they must wage alone. All you can do is love that person and Bob, you did that and Peaches knew you loved her.